flowers, originally uploaded by jahansell. One of the nicest sights around here is the rows of flowers the farms plant to sell as bouquets. I can't quite recall the name of the red and orange ones (it will come to me, or one of you will tell me! ), but the sunflowers dancing in the background are so lovely! beautiful! when you see flowers thriving like this, well that is one of the perks of summer! I think Ruth is correct. Celosia. The flower part is also very much like another flower whose name slipped my mind. Beautiful summer flowers...I wish I could cut some right now! 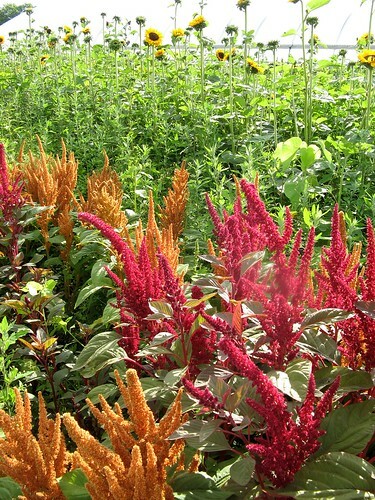 It is not Celosia - but I have been trying to figure out what this plant is for the last 3 years!! !